VCL. The very last match of the season saw the Vikings at home against the San Miguel Sheriffs. Playing Men’s Singles was Martin Foulcer winning 21-12. Triples, Olwyn Ratcliffe, Frank Barclay & Brian Dunn 24-21 and the rinks team of Pauline Rafferty, Andy Leggatt, Pat Rafferty & Eric Bishop 17-11. Shots, VB 110 (8) – 98 (6) SM. well done to all the squad, they finished third in the league, at times it looked like they could have done better. The Saxons were up at La Marina fighting to save their bacon, Just five points were needed to survive relegation and that’s exactly what they got, no more, no less…phew! Well done to men’s Singles Ian Kenyon for a win of 21-9…consistent right to the end Ian! Rinks, Beryl Regan, Sheila Whitehall, Jeff Neve & Mike Regan 20-16 and pairs Del Gunning & Peter Whitehall 15-15. Shots, VB 88 (5) – 90 (9) LM. Well done to both Captains, Sharron Kirk & Barry Norris also the selectors. SAL Spitfire league. 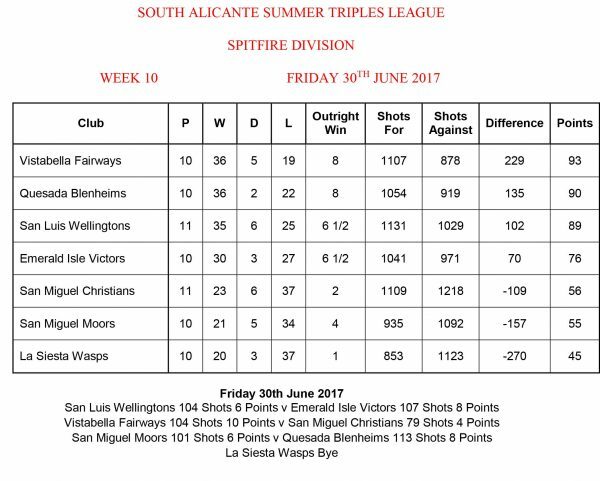 The Fairways at home to the San Miguel Christians took four wins thanks to the teams of Eve Blythe, Tony French & Bill Pain 26-9. Lynne Bishop, Barbara Brown & Ian Kenyon 20-11. Sandra Burrows, StJohn Broadhurst & Brian Dunn 19-13. Olwyn Ratcliffe, Arthur Brown & Ken Cuthbert 14-11. Shots, VB 104 (10) -79 (4) SM. keep going, two more games to go. Didn’t start the week off too well as La Marina TS lost to Quesada DS five nil. 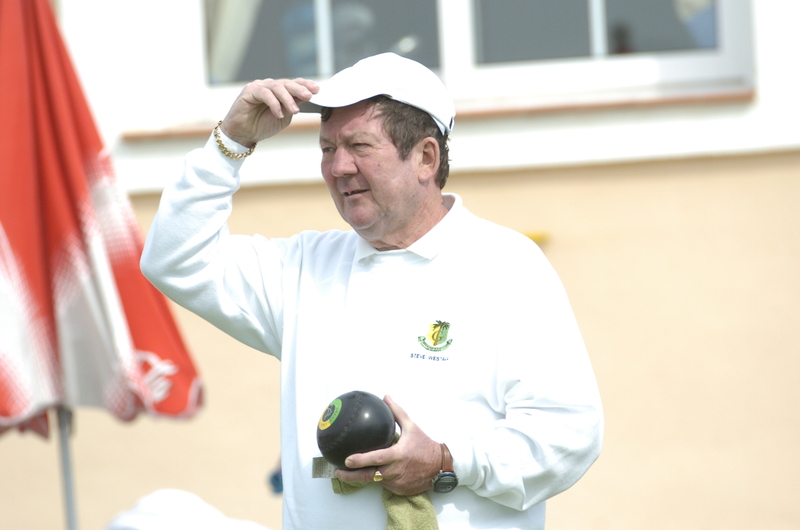 Dave Hadaway and Dave Taylor lost to Derek Sale and Terry Morgan and also losing were Peter Parsons and Tom Spencer. Still another two games to play. The last VCL game promised to be a cracker …and it was. La Marina needed ten points to stay up and Vistabella Saxons wanted five points. It was close throughout with the Singles finishing first as usual. This week it was Jan Parsons being the Star winning 21- 7 while Pete lost by a similar score. The Pairs was a close fought game all the way through with Margaret Finlayson and Tom Spencer winning all the way until the 17th end when they dropped a four only to pick up a three on the last end to get a draw. The Triples was a little easier but a good game to play in as our opponents clawed their way back picking up six shots on the last six ends. Thankfully, Barry and Wendy Latham and Carol Smith held on to win by three. The two Rinks each had great games. Barry Sadler, Dave Taylor, Roger Stacey and Dave O’Sullivan also dropped a four on the 17th end but got the necessary two on the last to secure a win by one shot. Our other rink again went very close everything coming down to the last wood on the last end. Unfortunately on this occasion it went to the Visitors. 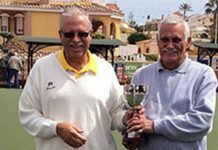 Counting it all up La Marina 90 shots and Vistabella 88 making the overall score 9 points to 5 in favour of La Marina. Can’t ask for any more than that. Well done to all who played in a great game for the last game of the season in the VCL. 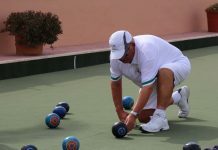 SAN LUIS BOWLS CLUB REPORT 30.06.17. 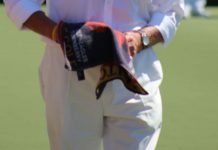 Wednesday 28th June VCLeague, SL Falcons were away, on a very hot morning, v Quesada Lions. Taking a good result from a match hard fought right to the very last shot – with Jules delivering a perfectly drawn shot to ensure another win; points 8-6, shots 109-88. 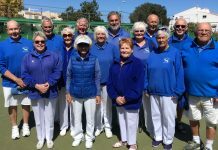 Winners: singles; Mal Hughes 21-6, rinks; Shirley Verity, Judy Carroll, Roy Cordell, Jules Pering 16-14, Kath Reid, Sheila Cammack, Sabrina & Russell Marks 24-9. 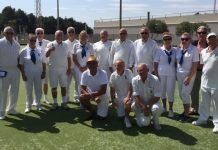 Friday 30th, South Alicante Spitfire Division: on another hot, thirst-making morning SL Wellingtons were home to Emerald Isle Victors, and had a frustrating result with 2 separate “last ends” that just didn’t go our way!! So close and yet so far; shots 104-107, points 6-8. Winners: Allen Bowen, June & Keith Jones 17-13, Judy Carroll, Jan & Brian Pocock 20-13. Colin Jackson, Bill Webb, Mal Hughes 18-16. San Luis Open Summer Rinks, is running on Tuesday evenings 6:00/6:30 from 20th June- 1st August. 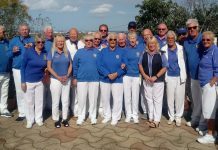 We are also participating in the “egg cup challenge” – 4 matches of 6 trips home & away v our close neighbours La Siesta, The 1st match on Monday 26th ended 3-3, that’s 1 down and 3 to go!! A good result at La Siesta winning on four rinks and drawing on one. 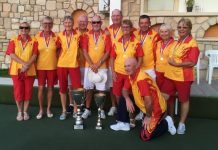 Well done to Alan Ashberry (mens singles) Babs Caiger (Ladies singles) Denise Ashberry and Bill Young (mixed Pairs) Rowena Good, John Caiger, Harry Dobson and skip Val Hignett. And the drawing rink Sheila Roberts, Mike Farrelly and skip Dave Melville. Shots Monte Mar 104 – 99 La Siesta. Points Monte Mar 11 – 3 La Siesta. The Torros were up against Greenlands Gladiators away. We managed to win on three rinks but lost on shots. Well done to the three winning rinks. 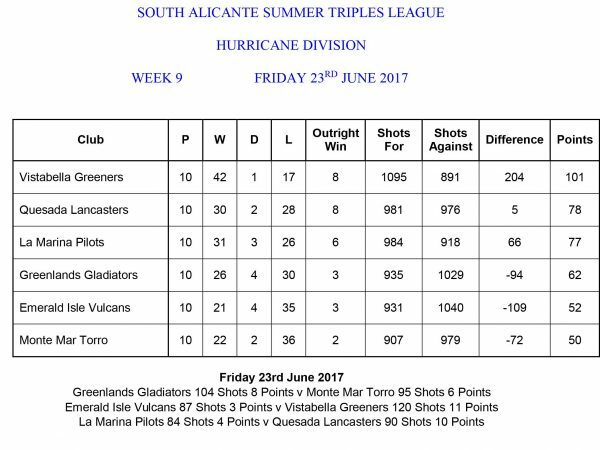 Shots Monte Mar Torros 95 – 104 Greenlands Gladiators. Points Monte Mar Torros 6 – 8 Greenlands Gladiators. Last match away to San Miguel only managed a win on one rink and a draw on one rink. Well done to the winning rink of Rowena Good, John Caiger, Harry Dobson and skip Val Hignett, and the drawing rink of Denise Ashberry and Bill Young. Shots Monte Mar Lords 98 – 115 San Miguel. Points Monte Mar 3 – 11 San Miguel. Brilliant result for San Miguel Deputies for the last game of the VCL season, gaining 11 points to 3 against La Siesta. Very well played by singles player, Anita Brown winning 21-9… played 7 games won 7 games, well done Anita. 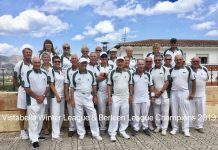 Mens singles Bob Nesbitt won 21-17; Pairs, Pat & Dave McEwan drew 13 across; Triples, Sheila Errington, Paul Hayward, Brian Errington won 24-19; Rinks, William Holtham, Dave Champion, Jim Jarvie, Eddie Cowan won 24-16; Rinks, Sue Milner, Keith Green, Tom Dalgleish, Alan Campbell lost 12-24. 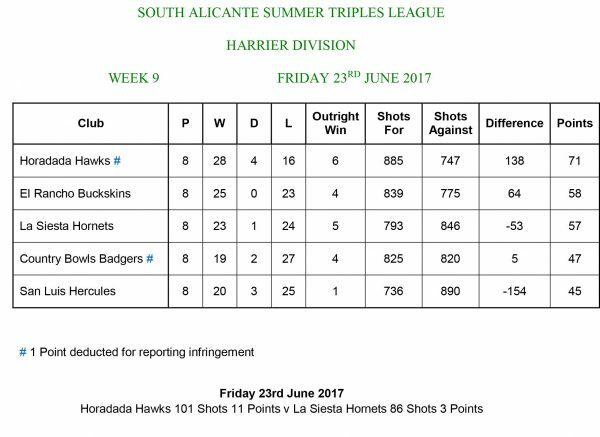 Shots for San Miguel 115, against 98. The Sheriffs were away at Vistabella for their last game picking up 6 points to 8. 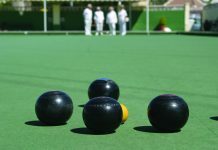 Results – Ladies singles, Mary Dyer won 21-18; Mens singles, Reg Cooper lost 12-21; Pairs, Noel Davis, Lyn Greenland won 18-16; Triples, Margaret & Allan Patterson, Clliff Plaisted lost 21-24; Rinks, Bob Hanton, Peter Ross, Lee Sinclair, Steve Cantley lost 11-17, Rinks, Jan Allen, Stuart Hemmings, Brian Allen, Dave Greenland won 15-14. Although only picking up 6 points, it was enough to keep us 2nd in the league – Well Done. In the Southern league, The Moors were at home to Quesada Blenheims picking up 6 points to 8. 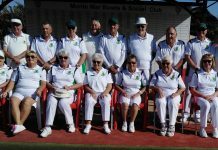 Well done to Sheila Errington, Cliff Plaisted, Brian Errington 21-13; Bob Hanton, Don Whitney, Bob Donnelly 18-16; Stan North, Barbara Scotthern, Eddie Cowan 25-12. Shots for 101 – against 113. 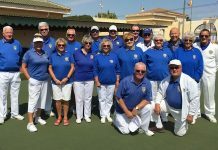 The Christians were away to Vistabella Fairways only managing 4 points, Well played by Paul Hayward, Tom Dalgleish, Steve Cantley 18-13; Anita Brown, Alan Campbell, Lee Sinclair 17-12. Shots for 79 – against 104. WASPS PLEASE NOTE – Wednesday afternoon WASPS will be suspended throughout the summer from 12th July until 13th September, due to the intense heat and dwindling numbers. Until then come along and have a game. €5 for an afternoons bowling, includes use of woods, shoes and free tuition if required. Bowlers of all abilities welcome. Club mornings as normal, Sundays, Tuesdays and Thursdays. Check the board for two coach trips – One to the Jalon Valley, the other to Guadalest (we did this trip last year, but it poured down the whole day, and visibility at Guadalest was NIL) Lets try again!!!! Also on the board is a FUN DAY followed by a Hog Roast – Get your names down!! !